Home > Shop By Brand > RUPES Polishers FREE SHIPPING! > Rupes LHR 75E Mini Random Orbital Polisher FREE SHIPPING! Rupes LHR 75E Mini Random Orbital Polisher FREE SHIPPING! The Rupes LHR 75E Mini Random Orbital Polisher is a professional detailer’s dream come true. You will finally be able to remove swirls and scratches from small and intricate body panels with speed and precision. The Rupes LHR 75E Mini Random Orbital Polisher is the first and only mini dual action car polisher that was developed with the professional detailer in mind. The Rupes LHR 75 Mini Random Orbital Polisher and its compact design, powerful 400 watt motor, and massive 12 mm throw will make this versatile car polisher a vital component of every detail. 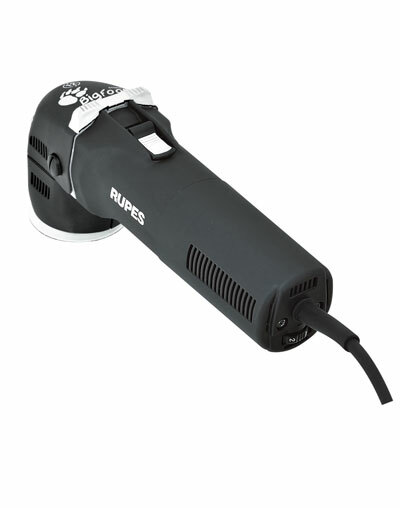 Rupes, a pioneer in the polishing industry, listened to the requests of professional detailers and car care enthusiasts and created a 3 inch mini polisher that is powerful enough to remove swirls and scratches with ease. The Rupes LHR 75E features a massive 12 mm orbit, giving it the correction ability that professional detailers demand. The powerful 400 watt motor ensures the LHR 75E doesn’t bog down under light loads. The Rupes LHR 75E includes a 3 inch backing plate that is designed for 3, 3.5, and 4 inch pads. With its non-slip rubber inserts on the front cover, the LHR 75E is perfect for all polishing operations in difficult to reach areas. The operator can work in perfect comfort to produce the best possible results. Lined in non-slip rubber, the on/off switch of the Rupes LHR 75E ensures a controlled soft start, giving the operator full control over the tool. Thanks to the small diameter backing plate, the Rupes LHR 75E is perfect in polishing applications on small and intricate areas. The small machine dimensions and the 12 mm orbit allow comfortable handling and accuracy in detail polishing. Made in Italy. 1 year warranty. Rupes LHR 75E HD Mini Random Orbital Polisher FREE SHIPPING! Rupes LHR 75E Mini Random Orbital Polisher Deluxe Kit FREE SHIPPING! Rupes Big Foot Detailer’s Kit - FREE BONUS FREE SHIPPING! RUPES LHR 75E Mini Orbital Polisher Standard Kit FREE SHIPPING! Rupes Big Foot Random Orbital Polishing SystemRUPES Polisher KitsMike Phillips’ How to Use The RUPES Bigfoot Paint Polishing System Rupes Foam PadsRupes Microfiber PadsRUPES Wool Polishing PadsRUPES Mille Foam PadsRUPES Rotary Foam PadsRupes UHS Easy Gloss SystemRUPES BigFoot LK 900E Mille Gear Driven PolisherRUPES BigFoot LHR 19E Rotary Polisher Now in Stock & Ready to Ship!RUPES BigFoot LHR15 Mark III Random Orbital PolisherRUPES BigFoot LHR21 MARK III Random OrbitalRupes BigFoot LHR15 MarkII Random Orbital Polisher - On Sale!Rupes BigFoot LHR21 MarkII Random Orbital Polisher - On Sale!Rupes LHR 15ES Big Foot Random Orbital Polisher FREE SHIPPING!Rupes LHR 21ES Big Foot Random Orbital PolisherRupes LHR 12E Duetto Random Orbital Polisher FREE SHIPPING!Rupes Bigfoot Nano iBrid Short Neck Kit FREE SHIPPING!Rupes Bigfoot Nano iBrid Long Neck Kit FREE SHIPPING! I absolutely love this polisher. Its perfect for getting into all those hard to reach areas Its heavier than it looks but once you have it in your hands for a bit you;ll realize the weight itsnt bad at all. I even had no problem controlling it with one hand . Iâ€™m enjoying this Rupes orbital polisher. Iâ€™m able to get in tight area that I couldnâ€™t with 6.5. Machine is Built very well and strong, it fell on the floor in still works good. ConsThe blue course pad did start breaking apart. Same quality you can expect from other Rupes. Its heavier than I thought but ideal for door jambs fenders and pillars. Excellent build, powerful, the Rubes pads are easy to clean and work well and great to get into tight places. ConsA little heavier than I tough but not to much. Used it a few times since I bought it. Compared to the milwaukee 3 inch rotary we have at work this thing is amazing.it has plenty of power. Complements my rupes 21 very well. Only reason I give it a 4 is that I prefer a trigger like the 21 has vs the on/off switch this model has.